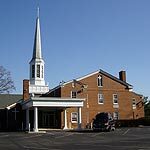 First Christian Church of Falls Church is a Disciples of Christ congregation that uses worship and celebration of the Lord's Supper as a spiritual focus. The Church believes in celebrating diversity and in outreach beyond the congregation. Like many churches in urban and suburban areas, the church faces demographic shifts in the surrounding area and the ongoing challenge of serving the needs and expectations of different age groups within the congregation.